Following on from the Canvas HD launched earlier this year, Micromax unveiled its newest flagship in India today: the Canvas 4 (aka A210). It’s pretty similar to the HD, packing an identical 5-inch 720p IPS LCD display (under a Gorilla Glass panel), MediaTek MT6589 1.2GHz quad-core processor, 1GB of RAM & 2,000mAh battery. Improvements over the HD that may justify its higher price include the 4′s 16GB of internal storage (expandable to 32GB), 13-megapixel main camera with Sony sensor & 5-megapixel front-facing shooter. An aluminum rim wraps the handset, which measures 8.99mm thick (0.35 inch) & tips the scales at 158 grams (5.6 ounces). 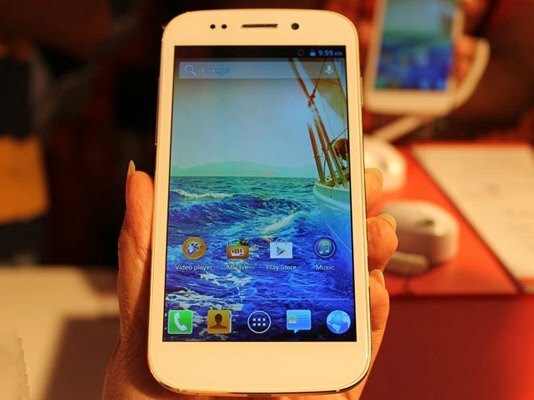 With dual-SIM support & a radio capable of HSPA+ data speeds, the device runs Android 4.2.1 Jelly Bean & touts software features like blow-to-unlock, look-away video pausing & pop-up window multitasking. Available in “Pristine White” & “Smoky Grey,” the Canvas 4 costs Rs 17,999 (around $295) with a free aluminum flip cover apparently worth Rs 2,999 (approximately $49) thrown in. Also packing 3G, Wi-Fi 802.11 b/g/n, Bluetooth, GPS/A-GPS and a 2000 mAh battery, the new smartphone lands on the market with Dual-SIM capabilities, paired with dual-standby functionality.